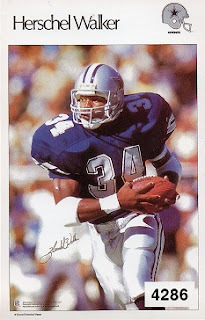 Readers of this blog know that my collection is tied in closely with the Herschel Walker page at the Trading Card Data Base. I've uploaded 682 out of a currently possible 937 cards. Of course, that 937 number can go up, as new sets are made that include Herschel; and occasionally, a set that has been around a long time, but hasn't been added to the database, pops up. Such was the case with a new blank space for a 1986 Sports Illustrated Poster Test Sticker #4286, that showed up recently. The problem for single player collector's, is that once your collection is past the beginning stages, it's fairly easy to buy a card you already own. The Sports Illustrated sticker sounded familiar and a quick check of ebay showed the Herschel card in question, albeit graded, and for a pricey $200. I decided to pull out my original Herschel card binder, and go through it again. I have the cards in chronological order, for the most part, but some odd shaped, and over sized cards are in the back. Lo and behold, I came across the test sticker in question, already in my possession. The back of the card is blank. Now I doubt that I'd pony up $200 for this card, graded or not, but the message is, when you see a potential need for your collection, take a minute and make sure you're not buying something you don't already own. I should note that many collectors don't mind, and actually seek out duplicates, but I have enough trouble trying to keep my one of's straight. I started keeping track of my collection on paper in 1998 because of not knowing what I had. I can't remember what cards were involved anymore but I remember that I was debating two cards at a card show and I chose the wrong one, it turned out that I had the one I chose and didn't have the one I left. Since then I've pretty much always known if I had something, even if I wasn't exactly sure where it was at any given time. Be a lot tougher for you Billy, with as many cards as you have in your collection. Still, it doesn't happen too often that I double up.